Three couples that I know have all recently had babies approximately within a month of each other! Today my friend's beautiful Baby Girl arrived into this world :-) Her partner brought the placenta home while mum & baby were still recovering in hospital. He asked me if I wanted to see the placenta. 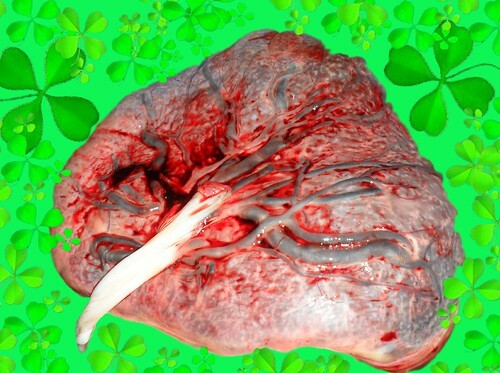 Wow, I never seen a placenta before, well not in the real world. It looked so amazing that I just had to make them a card using a photo. I couldn't believe how tree/plant like it was. This placenta seemed like a perfect example of what I had been learning previously while researching my paper in connection with exploring chaos theory and nature.